At its head office, CTC has been operating since December 2004 on it’s new facility: the European Campus. It offers a unique global solution to all requirements of the footwear, leathergoods and leather manufacturers. The CTC European Campus offers the world’s only platform for digital design and product development of footwear. 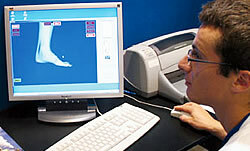 3D foot scanner with anthropometrical database and data processing solutions. 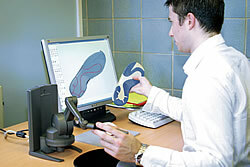 3D CAD-CAM modelling for footwear components (last, upper and sole). Rapid prototyping technologies (3D printing, vacuum casting). 2D CAD-CAM for design, pattern making and digital cutting. Shoe cost and technical specifications creation tools. The CTC European Campus is equipped with state of the art machines for footwear manufacturing and enables validation of the prototypes built with CAD-CAM tools and rapid prototyping equipment. Technical expertise with quick response time. Innovation, support with products, materials and processes. Technical, industrial and environmental management consultation. Standard or customised training / courses (all levels) for members of the entire footwear supply chain. Process development and optimisation at CTC’s or client’s site. Performance evaluation of finished products. With complete confidentiality and impartiality, CTC is dedicated to helping its clients improve R&D by setting new standards for innovation.